I got one of the new $5 notes in my change today and I wanted to know what it’s worth? So what are they worth? Well, that depends largely on the serial number, whether it’s a First Prefix (AA 16), Last Prefix (EJ 16), common prefix (all other prefixes AB-AK, BA-BK, CA-CK etc), or a special serial number. 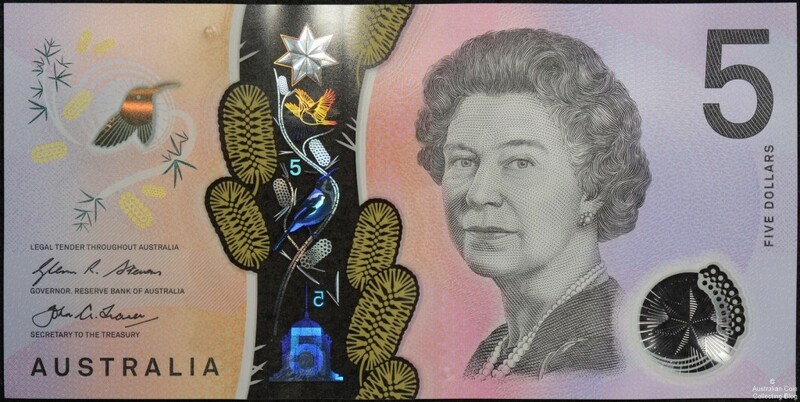 If you’re wondering what the serial number is, it’s the 9 digit number with two leading characters that can be found on the left side of the back of the new five dollar note. The two letters are known as the PREFIX and the two numbers immediately after the letters are the year of issue, that is 16 for 2016. The next 7 digits are the serial number. Each note has a unique combination of prefix, year of issue and serial number. Collectors of bank notes like to collect banknotes by serial number, with numbers of interest being the so called FIRST PREFIX (starting with the letters AA) and the LAST PREFIX. 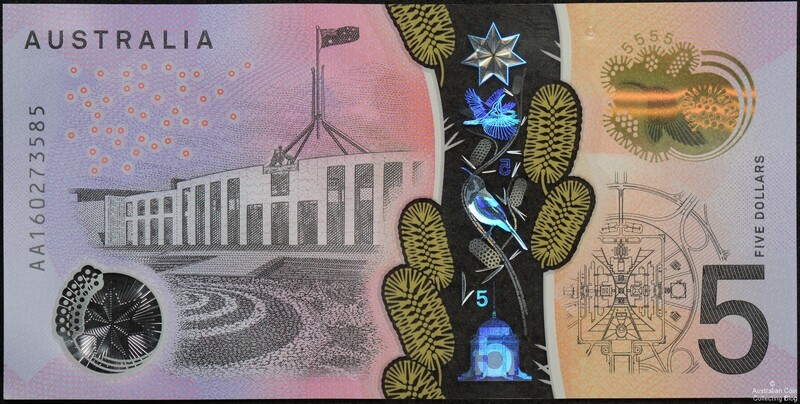 The letters for the last prefix generally vary from year to year and denomination to denomination but for the new $5 note the last prefix is EJ. First prefix AA 16 five dollar notes are worth a decent premium above face value. At the time of publishing of this article (November 2016) recent sold results on eBay show AA 16 $5 notes selling for anywhere from $25 for a single note down to $12-$15 for notes with consecutive serial numbers in groups of 2 to 200. Based on those results we’d happily value a First Prefix 2016 $5 note at $15-$20. Not a bad return on investment if you can get them for face value. At the time of publishing of this article (November 2016) EJ 16 last prefix notes show a similar story to the first prefix notes. Sold results on eBay show sold prices ranging from $15 to $25 with the majority toward the bottom end of that range. Based on those results we’d value a Last Prefix 2016 $5 note at $15-$20. Again, pretty good if you can pick up a bundle for face value at your local bank. Common or general prefix notes (those that are not first or last prefix) are much more common, with bulk of the 170 million of the new $5 notes being general prefix notes. These range from AB-AK, BA-BK, CA-CK finishing at EI. A quick glance at sold results on eBay indicates that the normal prefix notes are worth little to nothing above face value with prices realised ranging from $5 to $7 per note. Prices low enough that you must wonder why sellers are bothering, after Paypal and eBay have taken their cut of the sale there must be very little (or no) profit left. Based on that we’d value a general prefix note in nice UNC condition at $5-$6. There are times where common prefix notes are worth more than face, and that’s in the case of special serial numbers. It’s beyond the scope of this article to go into what different types of special serial numbers there are but the rule of thumb is that the more digits of the serial make up the special pattern the more the note is worth. For example, a 7 digit solid serial common prefix (for example AB 16 555 5555) is going to be worth a lot more than a semi-solid serial (for example AB 16 555 5512). Similar things can be said of other special serials such as repeaters, radars, and ladders. The exact values are hard to determine and you’d be best consulting with a specialised banknote dealer or collector when placing a value on such bank notes.